What is Cornerstone Integrated Liberal Arts? Cornerstone Integrated Liberal Arts is a 15 credit hour certificate program designed for all Purdue undergraduates. The two-semester first year sequence is taught by a team of award winning Liberal Arts Faculty. It is followed by three courses built around a series of themes designed to add depth to the student’s major. The Cornerstone certificate provides you with a road map to navigate the varied options of the Purdue core curriculum. It presents a set of classes that complements any student’s area of study and fosters the creative thinking that makes good business and industry leaders, and even more importantly, good citizens. What does doing a Cornerstone certificate do for me? Cornerstone enhances your ability to communicate with precision and to think critically and creatively. The Cornerstone themes offer specific sets of courses from which to choose that help you explore another area of interest or enroll in courses related to your major but studied through the lens of the humanities and social sciences. The additional competencies you develop in Cornerstone can provide you with an edge in the global job market, giving you skills that are highly prized by employers. It also aspires to inspire a love for learning that will enhance your life. What if I have already taken ENG 106 or COM 114? Can I still complete the Cornerstone Certificate? The answer is yes if you are a current Purdue or transfer student who has already taken ENGL 106 and COM 114 (or approved equivalent) , but new beginners starting Summer/Fall 2017 or current Purdue students who have not taken those courses prior to Fall 2017 must complete SCLA 101 and 102. How many UCC requirements can I fulfill with the Cornerstone program? If you complete the Cornerstone certificate, you will fulfill as many as six (6) UCC course requirements. SCLA 101 fulfills Written Communication and Information Literary. SCLA 102 fulfills the Oral Communication. To see how the Cornerstone themes can meet multiple UCC requirements, look here. How can I fit Cornerstone into my full schedule of classes? Cornerstone is designed to fit in your plan of study. 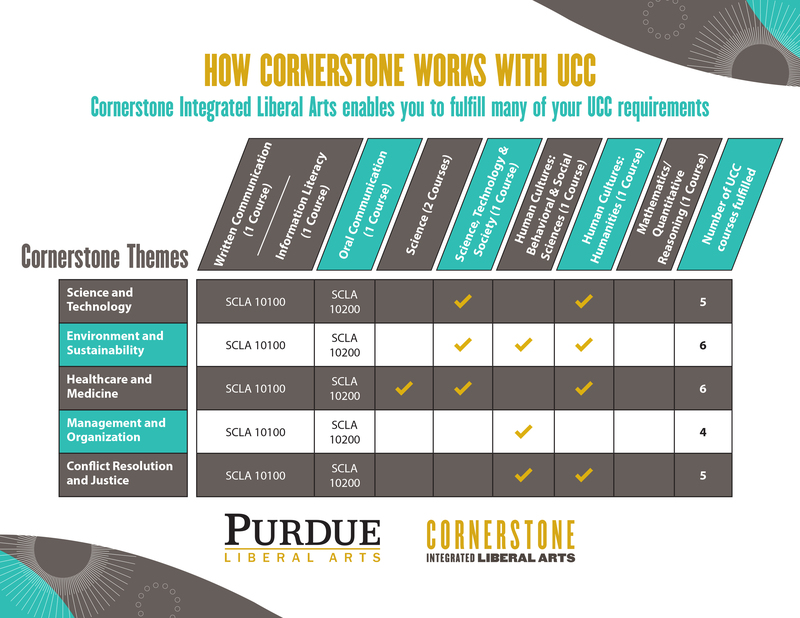 Because the first year classes, SCLA 101 and 102 fulfill UCC requirements, as do many courses within the Cornerstone themes, Cornerstone offers a coherent and purposeful array of classes that help complete your graduation requirements at Purdue. Talk to your academic advisor about the best way to include the Cornerstone certificate in your plan of study. If I decide to take SCLA 101 and/or SCLA 102, do I have to complete the Cornerstone Certificate? No. Taking SCLA 101 and/or SCLA 102 does not commit you to completing the certificate. However, by adding three courses in the themes, you will have Cornerstone noted on your transcript. What if my major requires courses with a pre-requisite of ENG 106/108 or COM 114? Do I have to take both that and SCLA 101/SCLA 102? Your academic advisor can discuss how SCLA 101 and SCLA 102 would be applied to your plan of study. Can I participate in the Honors College while completing the Cornerstone Certificate? Yes. The Cornerstone Certificate is compatible with the Honors College curriculum. Ask your honors advisor how to make it work. Who can pursue a Cornerstone certificate? It is available to any Purdue undergraduate regardless of academic major. Your academic advisor can help you build Cornerstone into your plan of study. I want to begin the Cornerstone Certificate. How can I learn more?